The concept, "Reflections," draws upon the home's classic details mimicked in new and contemporary ways. 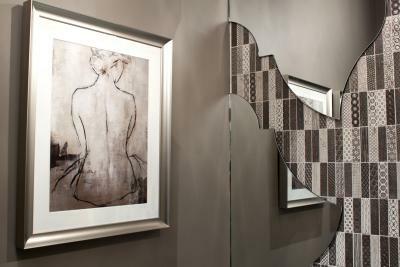 As a team we were driven by the idea of eliminating the lines that a mirror and bathroom vanity can create by incorporating the bathroom mirror directly into a wall mural. 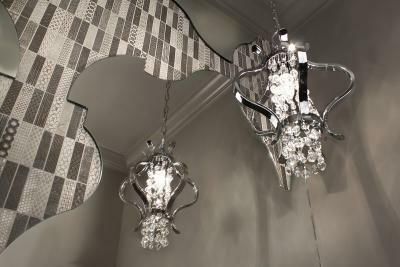 This allows an elegant space like a powder room to make a single dramatic statement. 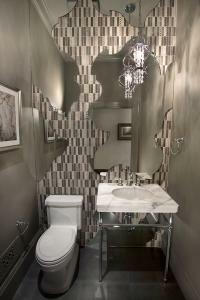 The mirror cuts away to reveal "Tracciato Diva" tile by Walker Zanger warmed by the rich taupe walls. "Steelwork Argento" Walker Zanger tile is laid to draw someone in. The polished chrome fixtures and calacatta marble countertop fuse traditional and contemporary elegance. Similar to art, our hope is that the silhouette of the design will cause someone to pause and reflect. Design featured in Houzz, Marin IJ and Mill Valley Herald. Click here to request additional information on this project.